کریمی, مهدی, نعیمی ‌آبکناری, آرش, حق‌شناس, نیما. (1396). تحلیل ارتعاشات غیرخطی یک واگن مسافری شش درجه آزادی و استفاده از جاذب دینامیکی در حالت تشدید اولیه و بهینه‌سازی با استفاده از الگوریتم ژنتیک. پژوهشنامه حمل و نقل, 14(1), 23-46. مهدی کریمی; آرش نعیمی ‌آبکناری; نیما حق‌شناس. "تحلیل ارتعاشات غیرخطی یک واگن مسافری شش درجه آزادی و استفاده از جاذب دینامیکی در حالت تشدید اولیه و بهینه‌سازی با استفاده از الگوریتم ژنتیک". پژوهشنامه حمل و نقل, 14, 1, 1396, 23-46. کریمی, مهدی, نعیمی ‌آبکناری, آرش, حق‌شناس, نیما. (1396). 'تحلیل ارتعاشات غیرخطی یک واگن مسافری شش درجه آزادی و استفاده از جاذب دینامیکی در حالت تشدید اولیه و بهینه‌سازی با استفاده از الگوریتم ژنتیک', پژوهشنامه حمل و نقل, 14(1), pp. 23-46. کریمی, مهدی, نعیمی ‌آبکناری, آرش, حق‌شناس, نیما. تحلیل ارتعاشات غیرخطی یک واگن مسافری شش درجه آزادی و استفاده از جاذب دینامیکی در حالت تشدید اولیه و بهینه‌سازی با استفاده از الگوریتم ژنتیک. پژوهشنامه حمل و نقل, 1396; 14(1): 23-46. شده­است. معادله­ی پاسخ فرکانسی سیستم در حالت­ بدون جاذب و حالت اتصال جاذب دینامیکی روی سیستم اصلی با هم مورد مقایسه قرار می­گیرند. با استفاده از الگوریتم ژنتیک3 که براساس یک روند تصادفی هدایت شده استوار می­باشد، به بررسی بهترین عملکرد جاذب دینامیکی در سیستم تعلیق شش درجه آزادی واگن پرداخته می­شود. در طی فرآیند حل معادلات غیرخطی و بهینه­سازی فرض بر این بوده که یک ورودی هارمونیک با دامنه بسیار کوچک به عنوان ورودی یکی از چرخ­ها به سیستم وارد شده­است. Designing the suspension systems has been investigated as a major challenge to eliminate the undesired effects in the vehicles. Dynamic analysis of a nonlinear six degree of freedom (DOF) suspension is investigated in the present paper. Dynamic equation of motions of the wagon which is consisted of the wagon main body and two bogies were obtained using Lagrange method and then the primary resonance mode frequency response equation under external excitation is derived by solving nonlinear equations through multiple time scale method considering six DOF for wagon vertical movement. A dynamic vibration absorber system is used to passively control and minimizing the primary resonance vibrations of nonlinear system. The frequency response equations of the system were then compared either with or without dynamic absorber. Using a genetic algorithm, which is based on a random driven process, the best performance of the dynamic absorber suspension of the wagon in a six DOF system is investigated. During the process of solving nonlinear equations and optimization, a harmonic input with very small amplitude was assumed as input exerted on one of the wheels. - اسماعیلی، م.، احمدی، م. ر.، فتحعلی، م. و شادفر، م.، (1392)، "تأثیر پارامترهای روسازی خط ریلی در وقوع پدیده واژگونی واگن"، پژوهشنامه حمل و نقل، سال دهم، شماره اول، بهار، ص. 1-15. - اسماعیلی، م.، و حیدری نوقابی، ح. 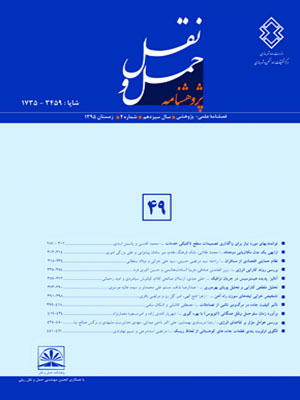 ر.، (1391)، "ارزیابی سه­بعدی رفتار خطوط ریلی به روش عددی در تحریک زلزله"، پژوهشنامه حمل و نقل، سال نهم، شماره دوم، تابستان­، ص. 97-115. - اسماعیلی، م.، و فشارکی، م.، (1391)، "بررسی تأثیر مشخصات خاکریز راه­آهن سریع­السیر بر ارتعاشات در محیط اطراف"، پژوهشنامه حمل و نقل، سال نهم، شماره اول، بهار، ص. 1-14. - علیزاده کاکلر، ج.، قاجار، ر. و توکلی، ح.، (1390)، "مدلسازی و تحلیل دینامیکی واگن مسافری سرعت بالا در سامانه ریلی ایران"، مجله مهندسی حمل و نقل، سال سوم، شماره دوم، زمستان، ص. 125-141. - ملاطفی، ح.، و ایزدبخش، س.، (1390)، "تحلیل و تست نرخ زوال ارتعاشات درخط آهن بالاستی"، پژوهشنامه حمل و نقل، سال هشتم، شماره چهارم، زمستان 1390، ص. 389-401. - میرمحمد صادقی، س. ج.، و هاشمی رضوانی، ف.، (1390)، "بررسی تأثیر سرعت بر نشست خط در راه ­آهن­های سریع­السیر"، پژوهشنامه حمل و نقل، سال هشتم، شماره چهارم، زمستان، ص. 415-424. - Baumal, A.E., McPhee, J.J. and Calamai, P.H., (1998), "Application of genetic algorithms to the design optimization of an active vehicle suspension system", Journal of Computer Methods in Applied Mechanics and Engineering, Vol. 163, pp. 87-94. - Bonsel, J. H., Fey, R. H. B. and Nijmeijer, H., (2004), "Application of a dynamic vibration absorber to a piecewise linear beam system", Nonlinear Dynamics, Vol. 37, pp. 227–243. - Camp, C. V. and Bichon, B. J., (2004), "Design of space trusses using ant colony optimization", Journal of Structural Engineering, Vol. 130, No. 5, pp. 741–751. - Camp, C. V., Bichon, B. J. and Stovall, S. P., (2005) "Design of Steel Frames Using Ant Colony Optimization", Journal of Structural Engineering, Vol. 131, No. 3, pp. 369-379. - Cheng, Y. Ch., Lee, S. Y. and Chen, H. H., (2009), "Modelling and nonlinear hunting stability analysis of high-speed railway vehicle moving on curved tracks", Journal of Sound and Vibration, Vol. 324, pp. 139–160. - Efstathiades, G. J., (1968), "Sub harmonic instability in nonlinear two-degree-of-freedom systems", International Journal of Mechanical Science, Vol. 10, No. 10, pp. 829-847. - Ferrara, R., Leonardi, G. and Jourdan, F., (2012), "Numerical Modelling of Train Induced Vibrations", Journal of Procedia-Social and Behavioral Sciences, Vol. 53, pp. 155–165. - Ghasemi, M. R., (1996), "Structural optimization of Trusses and Axis symmetric Shells Using Gradient based Methods and Genetic Algorithms", Department of Civil Engineering University of Wales Swansea, November. - Hunt, J. B., (1979)," Dynamic Vibration Absorber", Mechanical Engineering Publications, London. - Hunt, J. B. and Nissen, J. C., (1982), "The broadband dynamic vibration absorber", Journal of Sound and Vibration, Vol. 83, No. 4, pp. 573–578. - Ji, J. C. and Zhang, N., (2010), "Suppression of the primary resonance vibrations of a forced nonlinear system using a dynamic vibration absorber", Journal of Sound and Vibration, Vol. 329, No. 11, pp. 2044–2056. - Kaveh, A. and Shojaee, S., (2007), "Optimal design of skeletal structures using ant colony optimization", International Journal for Numerical Methods in Engineering, Vol. 70, No. 5, pp. 563–581. - Kinnear, K. E., (1993), "Generality and Difficulty in Genetic Programming: Evolving a Sort", In Proceeding of the Fifth International Conference on Genetic Algorithms, (Ed. Forrest, S.). Morgan Kaufmann, San Mateo, CA, pp. 287-294. - Nath, Y. and Javadeh, K., (2005), "Influence of yaw stiffness on the nonlinear dynamics of railway wheel set", Communications in Nonlinear Science and Numerical Simulation, Vol. 10, No. 2, pp. 179-190. - Natsiavas, S. and Tratskas, P., (1995), "On Vibration Isolation of Mechanical Systems with Nonlinear Foundation", Department of Mechanical Engineering, Aristotle University. - Nayfeh, A. H. and Mook, D. T., (1979), "Nonlinear Oscillations", Wiley Interactions, New York. - Rao, S. S., (2001), "Mechanical Vibration", 4th Edition, Person Prentice Hall, New Jersey. - Sun, L., Cai, X. and Yang, J., (2007), "Genetic algorithm-based optimum vehicle suspension design using minimum dynamic pavement load as a design criterion", Journal of Sound and Vibration, Vol. 301, No. 1-2, pp. 18–27. - Timoshenko, S. and Young, D. H., (1995) "Vibration Problems in Engineering", New York: Van Nostrand. - Tobias, S. A., (1959) "Design of small isolator units for the suppression of low-frequency vibration", Journal of Mechanical Engineering Science, Vol. 1, No. 3, pp. 280-292. - Yang, Y. B. and Wu, Y. S., (2002) "Dynamic stability of trains moving over bridges shaken by earthquakes", Journal of Sound and Vibration, Vol. 258, No. 1, pp. 65–94. - You-WeiZhang, YanZhao, Ya-HuiZhang, Jia-HaoLin and Xing-WenHe (2013) "Riding comfort optimization of railway trains based on pseudo-excitation method and simplistic method", Journal of Sound and Vibration, Vol. 332, No. 21, pp. 5255-5270. - Zhang, Zh., Zhang, Y., Lin, J., Zhao, Y., Howson, W. P. and Williams, F. W., (2011) "Random vibration of a train traversing a bridge subjected to traveling seismic waves", Journal of Engineering Structures, Vol. 33, No. 12, pp. 3546–3558.